2019 ASV RT75 / RT75HD for sale in Athens, AL. 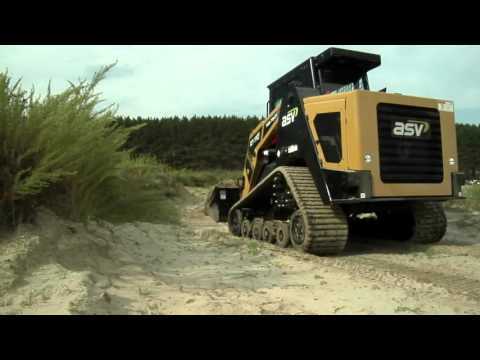 Haney Equipment Company Inc.
ASV's RT-75 is a mid-sized rubber track loader that offers an excellent combination of power, traction and low ground pressure. It's an ideal choice for working in a wide range of conditions from fragile turf to soft, wet underfoot. 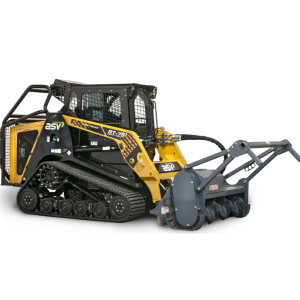 The RT-75 has 18 inch (475 mm) wide rubber tracks with undercarriages that are supported by flexible torsion axles so it gives the operator a smooth ride while it crawls over rough, uneven surfaces. The RT-75 Heavy Duty has all the standard features of the RT-75 plus the following features below. It works especially well in forestry and mulching applications. Track type: General purpose track constructed of rubber compound with embedded co-polymer cords and all-purpose treads. Drive system: Two hydrostatic direct drive sprockets controlled by a single joystick. Track drive sprocket: Elevated with low friction, replaceable sprocket rollers. Roller wheels: 24 high-density polyurethane and rubber wheels per track. Wheels include roller bearings. Roller wheel diameters: Front and rear wheels - 15 in. / 381 mm; Middle wheels - 10 in. / 254 mm. Controls: Intermittent via joystick button or continuous via control switch. Mode selectable via dash-mounted switch. Couplers: Push-to-connect couplers mounted on loader arms. Pressure relief valve mounted to coupler block. Hydraulic cooling system: High efficiency side-by-side radiator and oil cooler. Outlets: 1 12-volt port inside operator station. Wiring: Prewired for all factory-available accessories. Seat: Adjustable contour vinyl seat with built-in operator presence switch, lap bar and 2 inch / 51 mm wide seat belt. Loader control: Right-hand pilot hydraulic joystick controls loader lift, lower and tilt, plus intermittent control of auxiliary hydraulic system. Drive Control: Left-hand piloty hydraulic joystick controls machine speed and direction. Indicators & gauges: Engine oil low-pressure light; Hydraulic oil high-pressure light; Engine high-temperature light; Low batter voltage light; Hour meter; Fuel guage. Illumination: Four fixed forward-facing halogen lights; One adjustable rear-facing halogen light; One interior light. Convenience: One 12-VDC power port. Audible alarms: Horn and backup alarm are standard.